Nothing wrong with low-budget animated movies. I mean, budget has little to do with creativity and originality. It however is peculiar to see how little effort and creativity actually gets put in these low-budget sort of productions. As if they are only made to made some quick bucks, which I guess in fact actually, and unfortunately, is the truth behind these lame genre attempts. It is disappointing to see how movies often pick similar approaches and concepts. This movie in its core is also nothing more but a formulaic travel movie, in which the main characters have to get from point A to B and meet up with a certain individual to resolve a problem. And of course they run into all sorts of dangers and strange characters along the road. Or ocean bottom in this case. 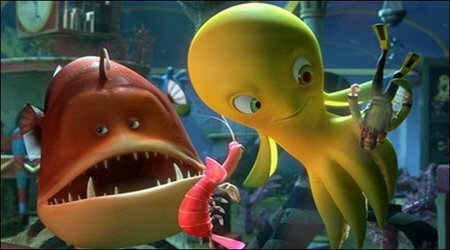 Animated movies set underwater are still popular of course, due to the success of "Finding Nemo" and its sequel "Finding Dory", but it seems that the possibilities with it are limited, since most of them are all doing the same things, with all of the same familiar and settings in it. This movie also mostly plays out by the numbers and features hardly any surprises or true creativity in it. It already starts with its very generic characters, that besides aren't handled too well. They are never interesting enough, never cute enough and therefore most of the time also not likable enough. The main character is even somewhat annoying. Not necessarily because of what he does or how he behaves like, but more due to the fact that its such an incredibly bland and formulaic one. No real personality behind him, or anything that distinct himself from any other character in this movie. It also is weird how this movie randomly throws in a bunch of new characters ever now and then without doing much with them at all. Characters often suddenly disappear out of the movie, without making much of an impact. It all feels so random and pointless. In a way it adds to the travel aspects of the movie, but it doesn't work out too well, since the characters are never anything too fun or memorable. It also really lacks a good main villain, or perhaps even a love interest. Clichéd yes, but potentially still something to make things a bit more interesting to watch. The story now instead remains nothing more but a very straightforward one, without any good side-plots or enjoyable enough secondary characters. The animations obviously also aren't anything too impressive, but no, it is nothing too terrible either. Definitely passable, I would say, The movie also definitely is colorful and joyful to look at for young kids, for which this movie obviously got made in the first place. It also is true that young kids will still find plenty to enjoy in this movie. Lots of jumping around, silly characters. nice colors and scenery's and simple jokes in this movie to entertain them. I am also therefore not going to destroy this movie completely, even though I obviously didn't enjoy it very much. It just isn't for me, which of course is no a surprise. An OK enough movie for the very young ones out there. It also is a positive and cheerful enough movie, with all of the familiar but right messages in them. I however still can't give this movie a pass for its lacks of creativity and true effort. It is a far too simplistic movie, in just about every regard. The songs are even absolutely worthless and I can't imagining anyone singing along with them, ever. I however can see people skipping them. They are just that terrible. A movie for the young ones only, who are easily entertained and are too distracted by a million other things to care about the lack of story- and true creativity of the movie.